What Keeps you Motiviated Daily? Whose online business do you admire most and why? Obviously The Suitcase Entrepreneur who went from working a 9-5 job to traveling the world while building her business and encouraging others to follow her path. Laura Kessler – A Music Business professional who also has a virtual business. She provides coaching, vocal performance, consulting, executive communication and more. The first time I talked with her I was impressed with how knowledgeable and personable she is. Our first conversation lasted over an hour and even thought we were working on the same project I walked away uplifted and encourage to promote my virtual business. 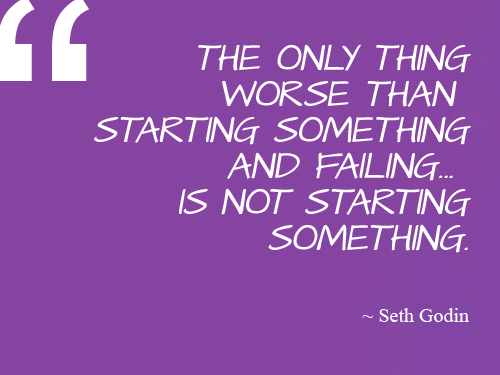 Seth Godin – I was first introduced to Seth Godin’s books, namely, Linchpin: Are you Indispensable? which I wrote about in a previous post. Seeking to create change and go against the norms, one always runs into people who tell you point blank “You’re wrong, the system is the system for a reason, because it works!” Reading Seth Godin’s books opened my eyes to the fact that even though there are accepted norms on society, we can create new norms by being unique. There are many more people and businesses who motivate me to press on. I like to call them the invisible cheerleaders because although they don’t know it, they have encouraged me to live life to the fullest and broaden my impact on others. One of the reason I’m driven to succeed is because I was born a middle child. You know what they say about middle children, statistically they are often overlooked and feel left it. It wasn’t that I felt under-appreciated growing it, it was just that I was always part of the crowd, and with four lovely sisters it was hard to stand out. Breaking out of that crowd and going off to do my own thing made me realize that although it is fantastic to belong somewhere, it is much more rewarding to strike out on your own and create success from those ventures. There are many sources of inspiration along the way. Who or what inspired you to take your unique path in life?